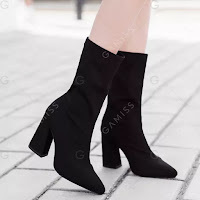 Winter weather has arrived, and each year I'm on a mission to find the perfect boots that work for casual and dressy outfits. I want to be able to shop, go to the office and go out to dinner without having to change my shoes every time :) Full transparency, no we don't get snow and rarely rain in Vegas, but it does get windy and down in the 20's and 30's overnight and into the morning. So we're cold! 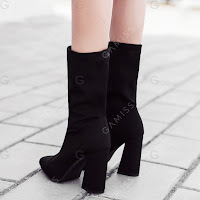 My favorite thing about these black chunky boots is the unique angle heel. They make me feel like I'm wearing an expensive pair of designer boots. These are only $26 by the way. I was pleasantly surprised at how comfortable they were. They have a pointed toe, which for us shorter ladies is always a plus in lengthening those legs. The top fabric is super stretchy and reaches about mid calf, or just below, and they're easy to get on and off in a hurry (pull-on without a zipper). 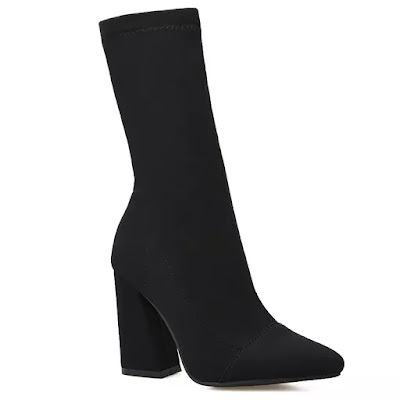 I plan on also wearing these boots under dress pants to the office and with a velvet midi skirt or sweater dress for date night. I'd say they fit true to size. I'm usually a 7.5 in boots and I ordered a 38. Those boots are too cute! I have gone boot crazy this season and bought a T(ON of them. I wear them with EVERYTHING! Thanks! Yes, boot crazy..Sounds like me too!